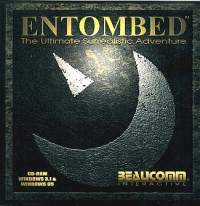 One of the rare adventure / puzzle games that boasts production value that rival big-budget games, Entombed is one of the better Myst-clones on the market (and diehard adventure gamers might call them glorified collections of unrelated puzzles). You are an archaeologist who accidentally stumbled into an ancient tomb. Puzzles are creative if not unique, with on-screen hints to help you along. A good game for all Myst fans. This classic Australian puzzle adventure game was first released as shareware, then commercially on CD in 1994, and lastly in an Enhanced CD version in 1997. Difference from the floppy version : CD-audio, Speech, 1 or 2 movies, version number 1.5.